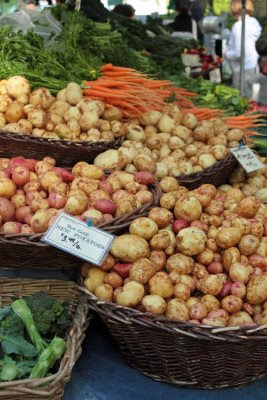 You may not think it, but there’s as big a difference between store-bought and farmers market potatoes as there is between tomatoes. Freshly dug potatoes are still moist from the soil, and their flesh seems luminous. They have whisper-thin skin, so there’s no need to peel them. And, of course, they are intensely flavorful, tasting of the earth they came from. Try them once, and it’ll be hard to go back to the grocery store. Here’s a recipe inspired by the beautiful potatoes at the farmers market and my favorite flavor of chips growing up. Place the potatoes into a medium pot and add enough water to cover by several inches. Add several large pinches of salt. Bring to a boil and simmer for 12 to 14 minutes, or until the potatoes are cooked through. Using a slotted spoon, transfer the potatoes to a bowl. Lightly mash the potatoes and let cool slightly. Stir in the crème fraîche, chives, egg, and flour and season to taste with salt and pepper. Add enough oil to a large, heavy frying pan to come to a depth of ¼ inch. Heat over medium heat until a bit of the potato mixture sizzles immediately when added. Scoop the mixture into the pan by the ¼ cup, spacing the cakes a couple of inches apart. Flatten each pancake slightly with a spatula and fry without disturbing for 3 to 4 minutes, or until golden brown. Using a spatula, turn the pancakes and fry another 2 to 3 minutes, or until golden brown. Remove to a paper towel-lined plate and immediately season to taste with salt. Fry the remaining potato mixture in the same manner. Transfer to a platter and serve immediately. Serves 4. These potato cakes have a crunchy crust and tender, creamy center. That's definitely up my alley. It sounds delicious! 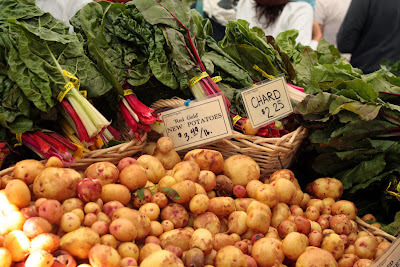 We are still weeks away from new potatoes, fresh from the soil, with those papery, edible skins. 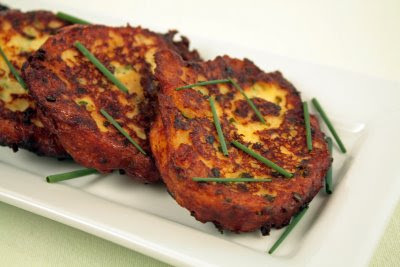 I couldn't let that stop me from trying these potato cakes, which include my favorite herb, chives. The recipe really delivered, in ease of preparation, creaminess, and especially flavor. Thank you, these little cakes are truly delicious. Can I use my Kitchen Aid mixer to mix everything? You could use your KitchenAid mixer, but this recipe really takes very little effort to mix by hand. These potato cakes sound truly delicious! Thanks for sharing the recipe. I'm going to give it a try! I just made these as a side with a nice steak. It was great, of course, being served with steak they got a very small truffle oil drizzle - Pure decadence! Any tips on shaping them? I had trouble making them as pretty as in your picture. I know practice helps, but pointers would be great. I used a 1/4-cup portion scoop to portion the mixture directly into the pan, and then I flattened each pancake slightly with a spatula. Hope that helps!